In discussions of that hoary question ‘Who is the greatest player of all time?’ assumptions tend to be made about the historical progression of playing strength which are by no means favourable to the old-timers. 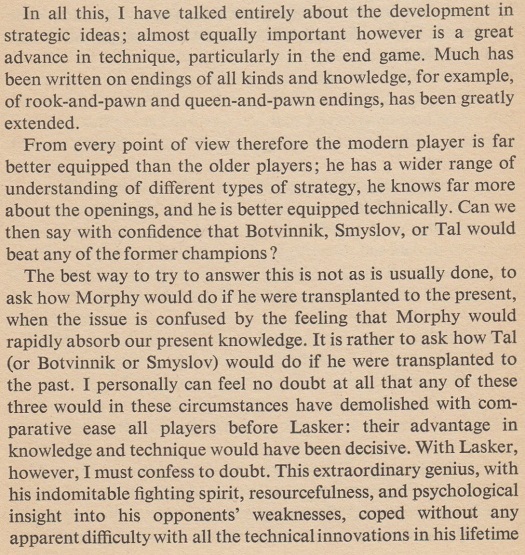 The view that chess is forever moving forward forces the conclusion that Morphy would have plenty to learn from the moderns, and one thus reads condescending speculation about how the American would fare today if he was generously granted six months or a year to ‘absorb all the new chess knowledge’ that has come into being since his time. His inferiority is further demonstrated by those deceptive ‘historical ratings’ and other mathematical sideshows. They have much to answer for, since it is only in the small print that we learn that if an Elo rating of, say, 2500 is a) earned by a modern player and b) dumped on a dead master that does not mean that the two are of comparable strength. The late Professor Arpad Elo confirmed this in a letter to us dated 18 November 1988. With recourse to reason and logic, can a case be constructed for actually believing that some of the oldsters would be capable of unhorsing today’s leading exponents without any additional schooling? Objectivity is certainly needed here too, for the glamour attached to such names as Anderssen and Spielmann may misdirect a commentator who is by temperament a laudator temporis acti. In many respects the overall level of chess play, in terms of quantity and quality, has progressed immeasurably in recent decades, but it is noticeable that however large the mass of ordinary club players and ordinary masters the number of outstanding exponents at any one time remains relatively small. It is with that élite that we are concerned here. It can be argued that almost every chess title, including that of world champion, has been cheapened in recent years. 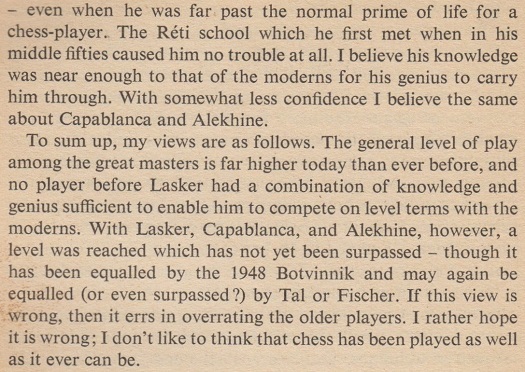 ‘Grandmasters’ are so plentiful that it is quaint to recall how, even in 1953, their proliferation was being criticized. In that year’s May issue of Chess Review (page 129) a correspondent, W.N. Wilson, complained about the ‘loose use of the term’, and the magazine agreed that ‘there is something in Mr Wilson’s contention that there ought to be a distinctive title for those who tower head and shoulders above all others in their generation. With a couple of dozen grandmasters around now, we ought to have a grade designated between the bulk of these and the world champion’. Chess literature too has developed. Analysis and annotations are often more thorough than in former times, even if the accompanying prose would have some of the old stylists quavering in disbelief. In writing a book about Morphy, P.W. Sergeant could give queen odds to Chris Ward. 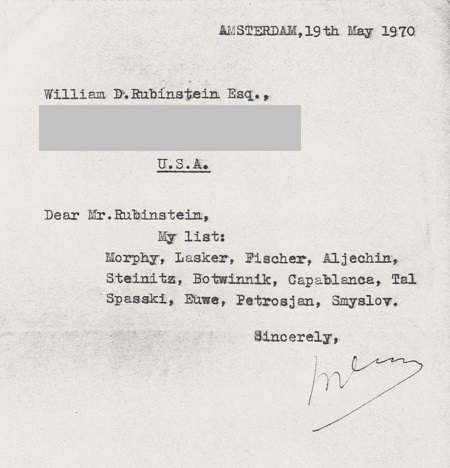 Even so, it may charily be suggested that only one post-War world champion, Tal, has been a truly brilliant writer, whereas two earlier champions deserve that accolade, Steinitz and Alekhine. Nor can the superiority of the old-timers necessarily be deduced from the fact that in some areas, such as blindfold chess, they were more skilled. Although it can be retorted that the ability to play sans voir is no measure of world-beating chess skill, it remains inconveniently true that a forgotten nineteenth-century player such as Alexander Fritz (1857-1932) could play 12 blindfold games simultaneously, a feat undoubtedly beyond nearly every master in the world today. A report of Fritz’s exploits appeared on page 172 of the June 1880 Deutsche Schachzeitung and, as an interlude, we may examine one of his games, also forgotten, from a four-board blindfold exhibition. The opposition is not strong, but if the game had been played, even with sight of the board, by a prominent master of today it would be a likely candidate for the anthologies. 11 Nd5 Rc8 12 Bxf6 Qa5+ 13 c3 Qxb5 14 O-O-O Be6 15 Nc7+ Rxc7 16 Qd8+ Nxd8 17 Rxd8 mate. Source: Deutsche Schachzeitung, October-November 1879, pages 336-337. A key issue in comparing old masters with new is the extent of advances in chess knowledge and the implications thereof. That more or less continuous progress was made throughout the nineteenth century and into the first three decades of the twentieth century it would seem churlish to dispute. Both Anderssen and Morphy had great positional skill in addition to their better-known tactical expertise, but knowledge of the openings, middle-game and endgame developed enormously between 1880 and 1930, as did the understanding of attacking and defensive technique and, even the importance of chess psychology. But by the end of the 1920s, the dust was settling on the Hypermodern Revolution, leaving a balance between the ‘Classical’ and ‘Hypermodern’ schools that has continued, with considerable stability, to this day. There has, to be sure, been an explosion of interest in – not to say obsession with – the openings, but of itself the level of activity means little. If Anand were to sit down today against Schlechter would he necessarily be at an advantage? Supposing that he opened 1 d4 and that after 1…Nf6 2 c4 Schlechter essayed 2…e5. The Budapest Defence is an opening on which Schlechter, not Anand, has written a monograph. We are often reminded, but still oftener forget, that opening theory is not an inexorable march forward. Lines, variations, sub-variations and entire openings come into and go out of fashion, by chance and whim. It is often claimed that the Danish Gambit (1 e4 e5 2 d4 exd4 3 c3 was dealt a near-lethal blow by 3…dxc3 4 Bc4 cxb2 5 Bxb2 d5 6 Bxd5 Nf6 7 Bxf7+ Kxf7 8 Qxd8 Bb4+. In reality, few openings are ever truly refuted and, even when they are, ignorance about the circumstances persists. Countless books ascribe the above Danish Gambit ‘refutation’ to Schlechter, whose magazine, Deutsche Schachzeitung, gave the line on page 80 of its March 1914 issue. Annotating Marshall v Důras, third match game, 1913, which featured ‘5…Nf6?’, Andrew Soltis wrote on page 216 of Frank Marshall United States Chess Champion (Jefferson, 1994): ‘Schlechter had not yet introduced the defense (5…d5! 6 Bxd5 Nf6) that would permanently retire the Danish Gambit’. In reality, Marshall himself, annotating that same game, had already written that 5…d5 6 Bxd5 Nf6 7 Bxf7+ Kxf7 8 Qxd8 Bb4+ 9 Qd2 Bxd2+ 10 Nxd2 Re8 ‘would make things rather interesting’ (see page 247 of the November 1913 American Chess Bulletin). Moreover, the move 5…d5 (answered by 6 exd5) had also been seen in E. Macdonald v R. Lean, Brighton, 29 January 1906 (see BCM, March 1906, page 128). Ignorance reigns, and one may wonder whether even Ponziani’s Opening may not make a comeback. 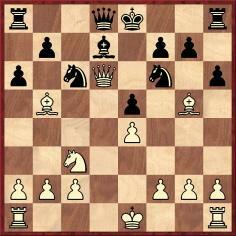 ‘Chess knowledge’ includes reams of analysis of 1 e4 e5 2 Nf3 Nc6 3 c3, but who today is familiar with any of it? Regarding the middlegame, it may also be asked what precisely has been learned for certain since around 1930. How many people today attack better than Alekhine (or even Anderssen) and defend better than Capablanca (or even Steinitz)? Are there fewer blunders today? As regards subtle strategy, are masters any closer to perfecting the proper technique for playing against hanging pawns or for switching an attack from one side of the board to the other? With respect to endgame theory, the most scientific phase of the game, substantial advances have been made, not least because of computer technology. But if far more is known does that necessarily mean that today’s masters are the superior endgame technicians? As we saw with openings, there is a vast difference between chess knowledge and what individual chessmasters, even the best, know. Chess knowledge is the corporate body of all discoveries, but no individual human brain has assimilated it all. Endgame theorists such as Averbakh and Rey Ardid have published multi-volume series on the various endings, but not even they would have committed to memory the entire content of their books, to the extent that it would unfailingly be at their fingertips in an over-the-board encounter. That can be done only by computers. It is self-evident that all chessplayers start from scratch in their acquisition of whatever chess knowledge they eventually take on board. What counts is the level of talent and of application. The heritage is not automatically self-promoting. These nebulous imponderables come into sharper focus if we consider the domain of endgame composition. Asked who were the greatest ever endgame composers, most people would be likely to say Rinck, Troitzky and Kasparyan, all figures from the past. No inexorable progression there. Do even today’s masters believe in their own superiority? Interviews indicate a mixture of views, but very few masters venture to claim that the ten strongest players of all time are all alive today. 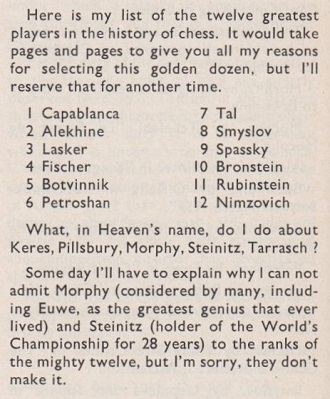 Personal ‘top ten’ lists almost invariably include a profuse sprinkling of old names, such as Capablanca. One can understand why he appears on almost everybody’s list: innumerable games were played by him in perfect style as far as anyone has been able to judge either then or now. Events such as his 1921 world championship match against Lasker and the New York, 1927 tournament were won by him without a single defeat. Indeed, in those two events, in which he played a total of 34 games against Lasker, Alekhine, Nimzowitsch, Vidmar, Spielmann and Marshall, it is difficult to find any game in which he even had a truly inferior position. The above article originally appeared at the Chess Café in October 1997. Source: Chess Life, January 1969, page 9.